This may have had extra appeal to me because I live just a few miles from one of the best regional theater companies in the country. (Don’t take my word for it–the Tony awards agree!) 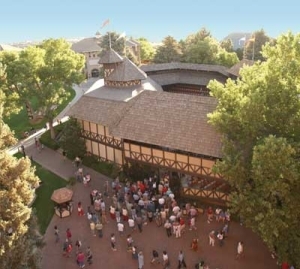 And every summer, I get to go to the theater pictured above and watch Shakespeare under the stars. It’s wonderful. Dialogue. Certainly plays would contain a greater percentage of dialogue than, say, a novel, but how much greater? How much of the word count of a play is taken up by soliloquies and stage direction? How much is left for actual dialogue? And can it really help me in my writing? I’ve answered those questions for myself by looking at plays over the last few weeks. Shakespeare in particular has a startling lack of stage direction (at least, startling to me.) And those long and lovely soliloquies (I’m a sucker for all of them in Thornton Wilder’s The Matchmaker) are really a very small percentage of the overall work. The dialogue in plays carries the burden of not only giving us insights into characters and eliciting emotional response, but of carrying the plot forward as well. A dialogue tip within a dialogue tip! Needless to say, I plan to read and watch more plays than ever this summer. What about you? What are your best tips for writing dialogue? Great tips! I eavesdrop more than once in a while. I have a keen sense of hearing, and I really like to listen to other people talk. Most of the time, it's about mundane things, but sometimes you catch a fascinating conversation! I have the slight super power of being able to hear really really well. Recently, I have *spied* on conversations at the aquatic center, a 60 year wedding anniversary party, church and the ever favorite Walmart. I like to think about how ages and ethnicities and demongraphics speak.